The pinks, blues, aqua, and yellow just look so sweet -- but I am not a pastel kinda girl -- so I made those colors bold. It has been a productive weekend so far 15 cards made bringing my total to 65...still have about 35 to go. This is for Simon Says Stamps Wednesday Challenge Furry Friends. I finally felt so much better after having come home to a cold, that I was able to get out to see the crafty gals without fear of infecting them. I also had a watercolor day with Peggy. 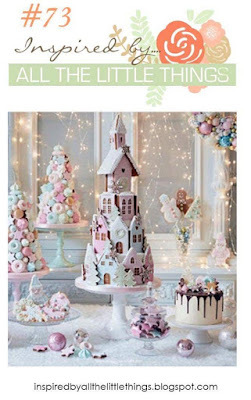 The crafty girls often put little gifties together for each other during the holidays. I came back to a bin full of fall and Halloween surprises, so I needed several thank yous. Today I am playing in two challenges. 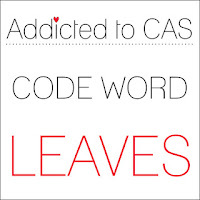 Addicted to Stamps and More - Anything Goes, and Addicted to CAS - Leaves. I finally got a another moment in my crafty space. The laundry had piled up...after this it is a marathon folding session ahead. 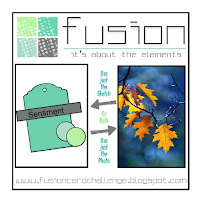 This card is for Fusion Card Challenge - Autumn Leaves, Just Us Girls - Thankful, and the Simon Says Flickr group challenge #83 Thankful. My supplies include : Distress ink in Salty Ocean, Copper Delicata Ink, clear ep, sentiment from Simon Says Stamp Autumn Greetings, and Penny Black Die Leaf Edger and some rose gold PPP sequins. I am having a lovely crafty afternoon. This card was inspired by the image at Case this Sketch, and a card by Lin, that can be found here. I loved that she created her own stencil. I recently sent some leaf die cuts to Greta, and I kept the paper with all the lovely cuts -- it's bristol paper so it works great for a sponging stencil. I took a bit of license with the sketch...my background colors are more contained...not loose watercoloring - but I feel sure you can still see the sketch. Oxide inks, Lawn Fawns stitched leaves (both sets), clear sequins and some versafine ink were my supplies for this card. We have had some warmer weather for a couple of days, and now the leaves are starting to turn outside my window. 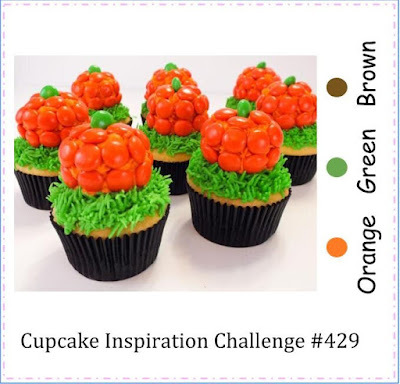 So I had great inspiration between the graphic at Cupcake Inspirations and my view. I used one of Simon Says Stamps exclusives featuring Newton's Nook images for my card. Coloring was done with Zigs on bristol paper; the lines and sentiment were stamped with versa-fine in smokey gray clear and then embossed to make staying in the lines easier. I finished the card with some fall mix sequins by PPP, and a few spatters of the green and orange zigs. The finished panel was mounted on a midnight green cardbase. I did get a card made for the card chain challenge for October. My recipient might think me a bit dim though. She lives in Australia and its spring time there...but I thought I would send her a touch of Autumn for her card. I went with the sketch option and the theme of Autumn, 2 of the 6 choices - you only need to pick one! Stop by the Card Chain Challenge and sign up for the November or December challenge. 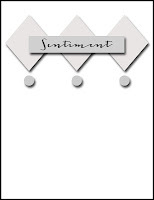 I was inspired by the design of this card - big sentiment, small image and side panels framing it all up. Here is my take using Count my Blessings from Stampin up and some Copic markers. It has been ages since I sat in my craft room to actually craft. I returned from California, my trip had been extended unexpectedly due to my Dad's health. All is good now, so I was able to return home. Hubs had been battling a cold and within a day and a half of being home I came down with it. I am on day 10 and am finally feeling better. I have graduated to clothing instead of jammies and blankies, but still lots of naps. Today I finished cleaning up my crafty space - I left it in a disaster while packing for my trip. I always have good intentions to leave it clean but that almost never happens. Maybe for the next trip. 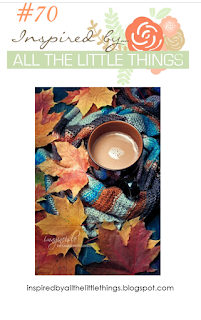 So on to the challenge - Have you see this fabulous graphic over at Inspired by All the little Things? I knew if I felt better in time, this would be my first card and challenge once I was back to it. I was inspired by the bids of blue peeking through and the leaves. I imagine it all sitting on a rustic picnic bench. The leaves are from Penny Black, my friend Greta had sent me some and I loved them so much I had to add the die to my collection. 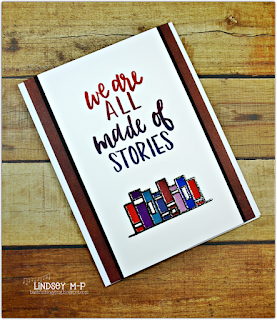 The sentiment comes from Simon Says Stamp and the wood plank stamp is my favorite from Stampin Up.